The Grolier Club Library was established to support the mission of the Club: the study and promotion of “the arts pertaining to the production of books.” The Library began in 1884 as a casual collection of a few hundred donated volumes. Today, largely through the generosity of its members past and present, the Library includes over 100,000 books, manuscripts, prints, and archival collections. Originally intended to serve the Club’s bibliophile membership, the Library has become one of America’s premier collections on the art and history of the book, nurturing the interests of collectors, aiding in the development of private and institutional collections, supporting the businesses of antiquarian book dealers and auction houses, and facilitating the research of bibliographers, typographers, designers, and students in the history of the book from all over the world. Little has been published about the Library, and a quarter of a century has elapsed since it was last exhibited. 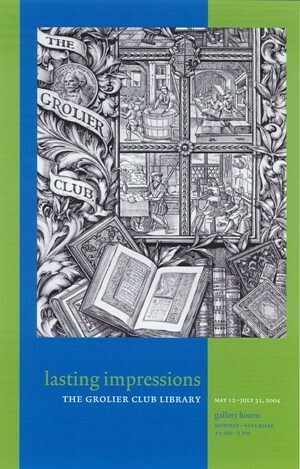 In offering this overview and its catalogue we hope to renew in the book-loving public some lasting impressions of the treasures available here. Curated by Eric Holzenberg and J. Fernando Peña, 2004.